Welcome to 2012's Knitting & Crochet Blog week, I hope that I can keep up with everything that will be going on. There will be 100's of posts to read, it may take a while. Colour is one of our greatest expressions of ourselves when we choose to knit or crochet, so how do you choose what colours you buy and crochet or knit with. Have a look through your stash and see if there is a predominance of one colour. Do the same with your finished projects - do they match? Do you love a rainbow of bright hues, or more subdued tones. How much attention do you pay to the original colour that a garment is knit in when you see a pattern? Tell readers about your love or confusion over colour. Well folks here is my stash, as you can see there is a fairly good mix of colours, but the red and blue spectrums seem to be the largest. I knit alot for babies and children so this seems to be the reason for that. If knitting for myself I tend to go fairly safe, usually dark or neutral. Rarely do I knit the same colour as the pattern though saying that my last project was fairly close to the pattern. I wish I could be more adventurous in colours for me. I like to adapt patterns for children to make them individual, adding a stripe or a bit of colour work just to make them a bit different. If you look through my projects My project page, you will see that my knitting goes in colour phases too. I hope I have done justice to Day One's topic. Looking forward to seeing what everyone else does with it. This is the topic for Day 2 - Photography Challenge Day! You have an amazing stash! I'm looking forward to seeing what some of those skeins end up becoming. Beautiful! I like the idea of personalizing childrens' clothing with different stripes. I love the idea of adding a color stripe to make an item individual. Such a great way to personalize children's items. Oh that is a lot of Red. That is one color I don't really gravitate toward. I like it but I don't feel like it's a color that speaks to me. Love all of the yarn though! I love looking at other knitters' stash ... it's so inspiring and it also helps me feel less guilty about my OWN stash! Love your stash and you do have a lot of gorgeous blues in there! 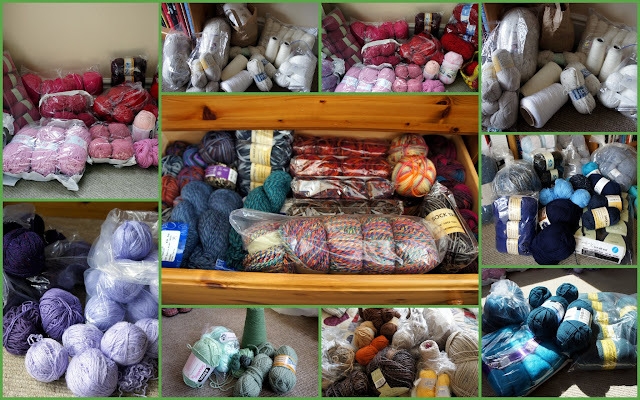 Stash is part of being a true knitter. Glad you are one of them! Just wish my stash was as tidy. You've got a great stash :O). That center pic, I love the yarn.